Hand made felt ball wreath. Perfect for adding a touch of cheerful delight to your home or special event. 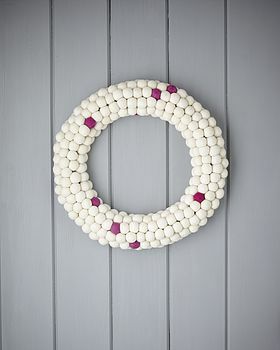 Our gorgeous felt ball wreath is hand made from softly felted merino wool balls in a soft white with pops of hot pink! it would look gorgeous hung on a door, above a mantel or anywhere else you fancy.